This article was awarded a prize and a lifetime honorary membership in The Society Of Jewelry Historians, USA. Fall, 1993. Earliest finds of copper, gold and silver were placer deposit pellets found in river beds. Occasionally crystal formations were found in rocks. In widely separated regions of the world ancient peoples picked up these shiny colorful pieces of metal, and hammered them into decorative sheets and forms. The earliest finds of platinum were placer deposits found only in Middle America for a very long time. The history of palladium is consequent to the history of platinum. It took the best scientific minds of the late 18th and early 19th century, over a hundred years before the properties of the platinum group of metals were discovered and understood and finally utilized. Specks of platinum appear in articles of gold found in Egypt, dated about 1400 B.C. 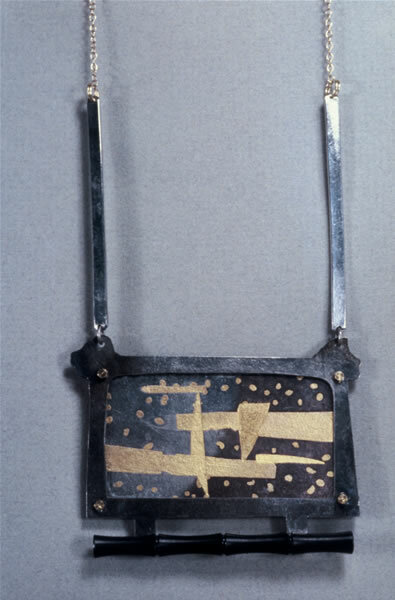 A small strip of hammered platinum, set into a gold and silver box believed to have been fabricated about 7th century, B.C., was found in Thebes. The largest quantity of ancient articles made of gold and platinum were found in 1921 by an archaeologist working in Ecuador. Along the northern coast, in the Esmeraldas region were found earrings, lip and cheek plugs, pendants and pectorals. They were carbon-dated to have been made about 200 A.D. The Indians of Ecuador would not have been able to melt platinum with their charcoal fire and blow pipe, since it melts at 3224 f. -- considerably higher than the melting points of copper at 1981 and gold at 1945. With great inventiveness they arrived at a process which permitted them to use platinum. They ground the nuggets of platinum as fine as they could and mixed them with powdered gold. Alternately heating the mixture to red hot on a charcoal bed, and hammering it, they were able to create a sufficiently homogeneous mass which could be hammered into a sheet. This process is called incipient diffusion or sintering. This process was independently rediscovered in the 19th century in Europe. In some regions of Middle America the platinum nuggets were considered a nuisance and were thrown back into the river to "ripen," a belief reported by the Spaniards. After the conquest by Spain there was much activity by the Spaniards in the search for gold. When panning in the rivers they kept finding the little white pellets. They resembled silver in color so they were given the Spanish name, plata, which was made into the diminutive, platina. According to a report from a visiting Spanish Naval officer in 1748, the Spaniards had to abandon several gold mines on account of the difficulty of separating the platina from the gold. It is curious that a metal once discarded as a nuisance now costs one and one-third more than gold in today's market. King Charles III of Spain was eager to find a commercial use for this metal, platina. He sent samples of ore to scientific societies in Spain and in Europe, for investigation. Spain held a monopoly on the metal for many years, and it was forbidden to ship the unrefined ore out of the New World. Although Spanish, French, German and British scientists were intrigued with the metal, there was little they could do since they could not even melt it. It was not until Joseph Priestly isolated oxygen for the first time, and Antoine Laurent Lavoisier, the father of modern chemistry, could utilize it to increase the temperature of his laboratory heating device, the gasometer, that consequent investigations could take place. In 1782 Lavoisier had some success refining platinum ore. His original experiment was repeated that year for the future Tsar of Russia and his friend, Benjamin Franklin. The original experiment was refined by others. Much of the ore still had to be smuggled out of Middle America to conduct later experiments. 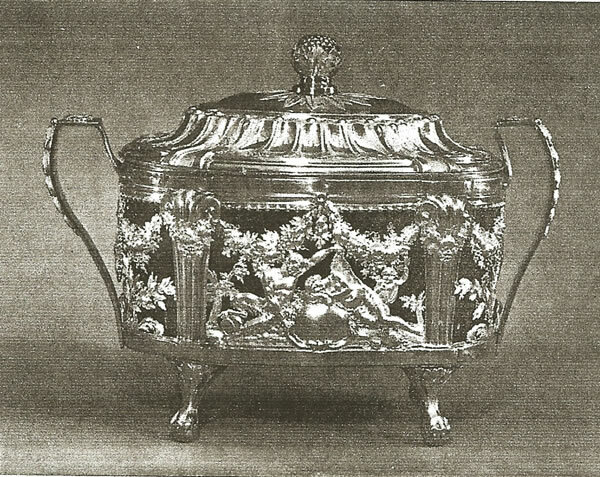 Marc Etienne Janety was goldsmith to Louis XVI, and history tells us that he was interested in the science of metallurgy, as well as goldsmithing. He worked for two years on his own experiments and arrived at platinum which was both strong and malleable. He fabricated crucibles, snuff boxes, mustard pots, buttons, spoons and plates. The only object still in existence from his workshop is a covered glass sugar bowl resting in a platinum decorative shell. It is dated 1786. It may be seen at the Metropolitan Museum in New York. Pierre Chabaneau in Spain was also researching the properties of platinum. Perhaps the most outstanding of these early platinum items is a large chalice weighing almost two kilograms (4.41 lbs), crafted in Spain by Francisco Alonso for Pope pius VI in 1788. Scientists began working with a precipitate which had puzzled them during chemical experiments with platinum of 50 years before. Eventually this precipitate was the means of discovering the five additional members of what came to be known as the platinum group of precious metals. Each of the six metals is an element in the periodic table; each has unique physical properties. London physician William Hyde Wollaston and chemist Smithson Tennant worked together for nine years before their first breakthrough which led to the discovery in 1802 of the second member of the group: palladium. Palladium was named after the second largest asteroid of our solar system, Pallas, which had been discovered that year by German astronomer Heinrich Olbers. He named the asteroid after the Greek goddess of mythology Pallas Athene, associated with wisdom and the arts. Palladium is very malleable and ductile. It has a melting point of 2831 f., which is lower than that of platinum, and is less dense. A pellet of palladium weighing less than one-fourth ounce can be beaten to a paper-thin sheet thirty-five feet square. Wallaston continued to work with the chemical residue of the platinum and succeeded in isolating another metal. He called this rhodium, from the Greek word meaning rose, since that was the color of the solution of its salts. Rhodium has the highest electrical and thermal conductivity of the group. Its great reflectivity and high melting point (3542 f.) makes it an ideal surface for many scientific purposes. In 1803 Tennant discovered two more metals of the platinum family group. Iridium, named for Iris, Greek goddess of the rainbow, proved to be an ideal alloy to strengthen the softer platinum and palladium. It has a very high melting point (4424 f.), but is brittle alone. Tennant's fourth discovery was osmium. It is the heaviest metal on earth. A cubic foot would weigh almost three quarters of a ton. It has the highest melting point of the group at 4892 f.
It took forty-two more years before the last member of the platinum family group was identified. It was the most difficult to isolate. The eminent Estonian chemist, Karl Karlovitch Kraus found it and named it ruthenium after Ruthenia, a region now in the U.S.S.R. Ruthenium has a melting point of 4190 f. and serves as an important alloying metal with platinum and palladium. Spain continued to hold a monopoly on platinum until the metal was found in the Urals in Russia. In 1828 Russia declared a state monopoly, and except for rare concessions to outsiders, most of the ore was refined in St. Petersburg. In 1850 a license to refine platinum ore was granted to a British metallurgist, George Matthey, who represented a refinery of precious metals. The company was Johnson Matthey & Co., which remains one of the major refineries in the world of gold, silver and platinum. The refining of the ore is a series of steps: flotation, oxidation, roasting and leaching with chemicals to separate the platinum from the nickel and copper matte, with which it is usually found. There are an additional 200 steps, which may take as much as a year to purify the other metals in the group. The actual steps are trade secrets. Since platinum and palladium do not oxidize and are impervious to most acids, and will melt only at extraordinary temperatures, these metals play an important role as catalysts. A catalyst is an element or compound capable of triggering a chemical reaction in another substance, while remaining unchanged by the process. That has been their main role, from the beginning of the rayon industry in the 1930's to current automobile emission catalyst needs. The National Institute of Standards and Technology employs weights and measures made of platinum by which all else is measured. Platinum will not change -- an ounce is an ounce forever. 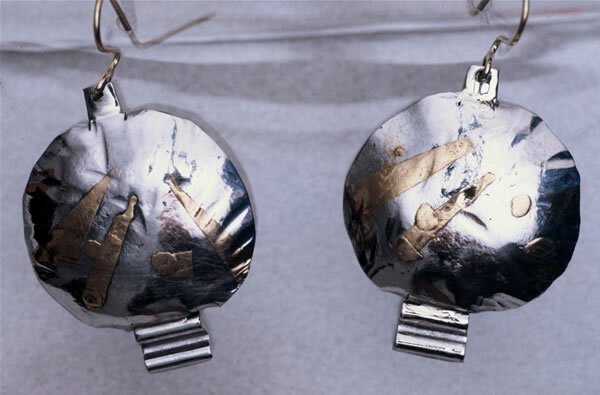 There were technical impediments to the widespread use of platinum by the jewelry industry. The heat necessary to melt platinum could not be easily generated in a jeweler's workshop until the discovery in 1877 of a method to liquify and store oxygen in pressurized steel cylinders. 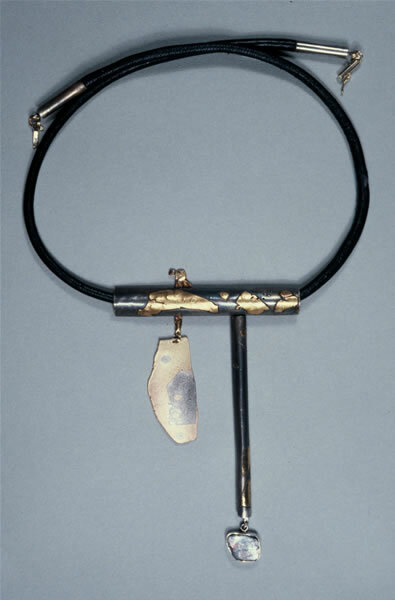 This led to the jeweler's torch, which burned a mixture of oxygen and town gas that could reach temperatures to melt platinum for welding and creating all-platinum jewelry work. The Peter Carl Faberge studios in Russia were using platinum in the 1890's. Among the luxury objects and fantasies created for the Swedish and Russian Nobility were the famous Easter Eggs. The Spring Flowers Egg, 1890, opens to display a tiny openwork basket made of platinum, each bar encrusted with diamonds. The Coronation Egg, 1897, houses a miniature coach perfect in every detail, its gold wheels clad in platinum rims. The jeweler who is credited with the widespread interest and use of platinum for precious jewelry is Alfred Cartier of Paris. In the 1850's he realized the advantages of having a strong white shiny metal for use in setting diamonds. He was able to create fine settings which were almost invisible, yet were strong and did not tarnish. Platinum is so ductile that one ounce can be drawn into a wire two miles long. 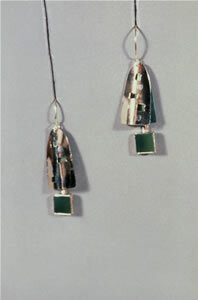 Silver had been used for stone settings previous to the use of platinum. White gold was not developed until the turn of the century. The use of platinum for rings and pins using diamonds and precious stones continued for decades for very expensive jewelry. There was a widespread use during the twenties to thirties in the Art Deco period. 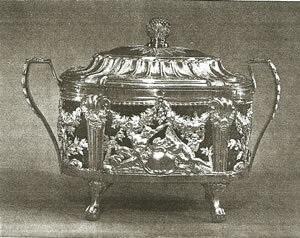 Jewelry and accessories of platinum were created in France, Great Britain, many of the European capitols and in the United States. It is estimated that the annual demand for platinum during the twenties was well over 100,000 troy ounces, with the greater volume used in the United States. At that time the cost of platinum was five times that of gold, but it became the metal of choice for all precious jewelry for those who could afford it. As the Duchess of Windsor, an international style setter, proclaimed on the subject, "A fool would know that with tweed or other daytime clothes one wears gold, and that with evening clothes one wears platinum." With the advent of World War II, platinum was classified as a strategic material and was restricted in its distribution to the jewelry industry. White gold replaced it to some extent. In 1961 Graham Hughes, the Art Director of the Worshipful Company of Goldsmiths, in association with the Victoria and Albert Museum, sponsored the "International Exhibition of Modern Jewelry 1890-1961." Finland, Denmark, Switzerland, Italy, Spain, Great Britain, France, Russia, Belgium, Brazil and the united States were represented. Work from Lalique, Fouquet, Templier, Tiffany and Cartier were displayed as well as work either designed, or in some instances actually created, by famous painters and sculptors -- Picasso, Calder, Arp, Daliand Lipchitz. 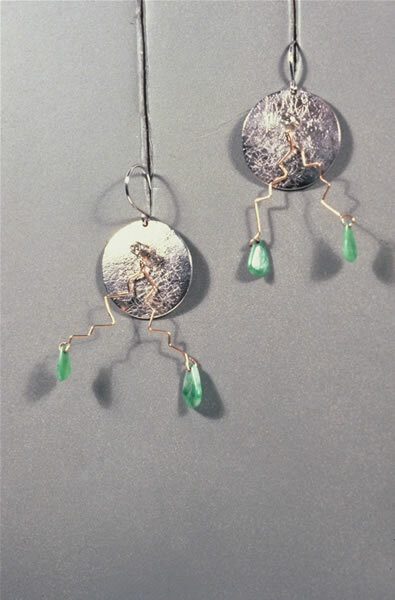 Among contemporary European jewelry designers represented were Friedrich Becker, the Pomodoro brothers, Jean Schlumberger and Bruno Matinazzi. Jewelers from the United States included John Paul Miller, Margaret de Patta, Stanley Lechtzin, Philip Morton and Mary Kretzinger. Nine-hundred items were displayed representing an incredible range of techniques and orientations, from precious gems and metals to art object jewelry seen for the first time in an international arena. Work in plastic, iron, glass, steel, ivory and aluminum shared space with diamond encrusted tiaras made for royalty using platinum and gold, Art Deco platinum necklaces and cigarette cases alongside electroformed copper jewelry. And yet, of the 901 pieces displayed, over ten percent were of platinum, demonstrating the considerable market for platinum during that period. There has been a platinum shop at the Victoria & Albert Museum since 1986, and even with restrictive hallmarking laws, 20,000 pieces of platinum jewelry has passed through Great Britain's Assay Office 1980-81. Thanks to the promotional campaign of De Beers' for diamond engagement rings (set in platinum), addressed to the Japanese market, there has been a steady increase in sales of platinum rings and other jewelry items. In 1988 Japanese jewelry manufacturing used 1.06 million troy ounces, an increase of thirty percent over the year previous. West Germany, Italy, Hong Kong and other countries have a growing platinum market. With these markets already established, it seems an ideal time to reintroduce palladium as a precious metal for jewelry. During the period when platinum was restricted to the industry, palladium was used. In Leslie L. Linick's Jewelers' Workshop Practices, published in 1948, he suggests that the use of palladium be for earrings, ear clips, large brooches and hair ornaments because of the lighter weight of palladium. He also mentions the use of ruthenium for hardening the metal. In another section he lists the contents of a palladium electroplating bath. stone settings were available made of both palladium-ruthenium and palladium-iridium, just as they are today. My introduction to palladium was in the 50's when I had a jewelry studio in Chicago. A client came to me with a diamond engagement ring made of palladium. She wanted me to design a wedding band of the same material to be worn with it. I did not have the equipment to cast material with such a high melting point, so I took my wax model to commercial platinum casters in the industry. Filing and polishing the palladium ring was the extent of my metalsmithing, but it did serve to demonstrate the bright white surface of this metal. 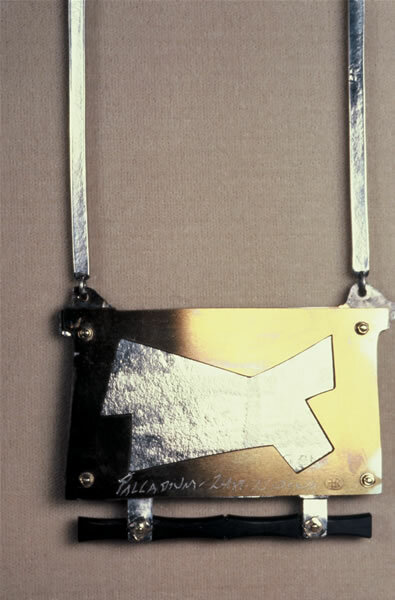 I did not consider using palladium as a jewelry material until the summer of 1989 when I read an article about the Stillwater Mine in Montana. This is the only platinum-palladium mine to be found in the United states. The ore from this region produces three times the palladium to one of platinum. This is a reversed ratio to the ores found in the major sources of the metals in South Africa and Russia. After looking into the history of platinum and palladium I became interested in seeing how it would respond to metalsmithing techniques. I was of course interested in using a precious metal which was priced so much lower than platinum and at that time less than one third of the cost of gold. Starting with a one ounce Johnson Matthey ingot of palladium, which I ordered from a local coin dealer, I subjected it to the customary metalsmithing procedures. I discovered immediately that it was very malleable. I rolled it down, I sawed it, I forged it, imprinted the surface, made wire, welded and soldered the wires. Because of its high melting point the usual goldsmithing approach must be modified. A knowledge of platinumsmithing is necessary. Starting with the ingot of pure palladium measuring 24mm X 42mm X 9ga. I cut a strip 44mm wide and without annealing used a rolling mill to roll it to a square wire 1.5mm. I then drew it down in a drawplate to a round wire O.8mm (or 20ga). It did not work harden, but I annealed it when it approached one-half of the starting thickness. I used the same approach to annealing when I rolled down the sheet. I found the metal to be very ductile. A strip from the ingot 4mm X 42mm X 9ga was rolled, then cut into two strips each 9mm X 90mm X 30ga. On the last rolling I textured it with steel mesh between copper plates. 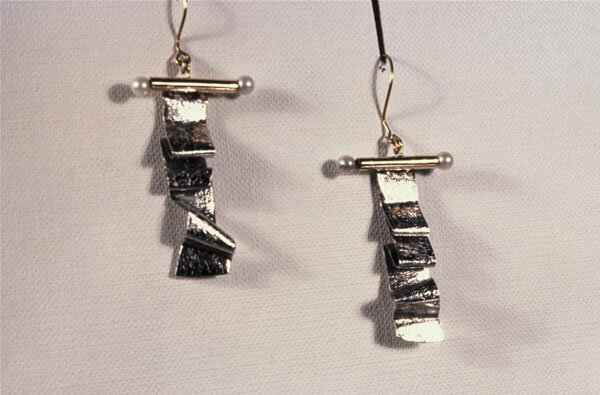 These two strips were ribbon folded and incorporated with gold and pearls to form earrings. Next I rolled down a section of the 1.5mm square wire to form a strip 3mm wide X O.45mm thick. This became a bezel for a stone. Shaping the strip to conform to the irregular stone, I welded the ends together. The technology used for working platinum is not harder than goldsmithing, it is just different. The bezel was soldered to a 24ga sheet of palladium using 18k white gold welding solder. Palladium has a melting point of 28310 f. compared to 19440 f. for gold; the melting point of platinum is much higher at 32160 f. In setting the stone in the bezel, a hand pusher is sufficient since the palladium is quite soft. The next project was to inlay round palladium wire into undercut slots, cut and filed into the sides of a cast 14kt yellow gold ring. The conventional inlay technique worked well but the result was disappointing since there was too little contrast between the two metals. The inlay did work well with a red gold alloy. There is a technique of bonding one pure metal to another using heat and pressure. At the interface the molecules of each metal transmigrates into the other creating an alloy. 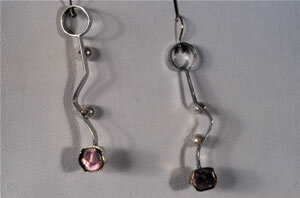 This bond is similar to the colloidal diffusion joinings found in Hellenic Greek jewelry and with some variation is similar to the technique used in granulation. Since I had been using the diffusion bonding technique for fine gold on silver I was curious to see if I could work with palladium in the same manner. I was able to bond 32 gauge palladium foil to red gold and in another piece of jewelry bonded fine gold to palladium, leaving the natural blue-purple oxidation as background color. Pure palladium, as well as palladium alloyed with 5% and 10% ruthenium for added hardness, can be used for fabrication and for casting. Another important use for it has been in the creation of white gold. The term "white gold" is a contradiction in terms since it is the rich color of gold which helps identify it. Most of the experimental alloys used nickel as the major element plus varying percentages of zinc, aluminum, cobalt, chromium, indium, iron or other metals. Experimentation in seeking a good workable white gold is ongoing. The introduction of palladium to the alloy has improved the workability and the color the resulting metal. Eighteen karat white gold-palladium is a malleable, workable white metal which fulfills the function of platinum in many respects and is considerably cheaper than platinum. Eighteen karat white gold-palladium and jeweler's palladium are available in casting pellets, sheet and wire. Although European and Japanese goldsmiths have used palladium in their creation of precious jewelry, it seems that in the United States many goldsmiths are unacquainted with it. I hope that this paper will serve as an introduction to palladium. The Manufacturing Jeweler, Vols. 1957, 1958, 1959, Providence, R.I., Walter B. Frost & Co., Inc.
By Marc Etienne Janety, 1786. Platinum exterior, blue glass liner. (Permission granted by Metropolitan Museum of New York for reproduction). 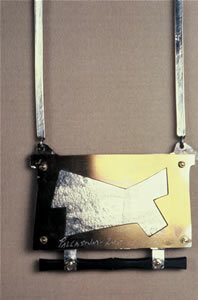 All work below was created in the period of 1989-1992 by Florence Resnikoff. 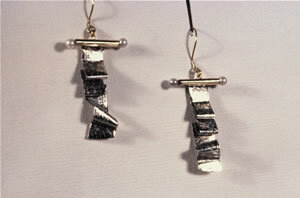 Rolling mill textured strips of pure palladium and folded with pearls. 1 1/2" x 1 1/8"
Palladium-Iridium alloy 18 kt red gold settings for pink tourmaline crystals. Pearls. 2 1/2" x 1/2"
Pure Palladium, 18 kt gold, diamond, Chinese jade. Textured, domed PD. 2"x 7/8"
Double examples of colloidal diffusion, 24kt gold, to pure palladium and pure palladium foil bonded to pure silver, oxydized. boulder opal, leather cord. 11" x 6"
24 kt gold diffusion bonded to pure palladium 14 kt gold chain. REVERSE: Anodized niobium, onyx bamboo 2 3/4" x 2" x 10"
Pure palladium, 24kt gold bonded, textured, domed. 1" x 1 1/4"
Rectangles cut from pure palladium sheet. Green anodized niobiumshows through. 18kt gold and jade.